JOHANNESBURG (AP) — It could all hinge on the toilet door. Oscar Pistorius goes on trial for murder on Monday, but some experts not involved in the case say the double-amputee runner could still be vulnerable to a homicide conviction even if he is acquitted of murdering his girlfriend. That's because, they say, he violated the most basic tenets of gun-handling by shooting into a closed door without knowing — at least, by his account — who was behind it. South Africa's criminal justice system and gun culture will be under a global spotlight during the Pistorius trial, which has some parallels with the O.J. Simpson case in the United States 20 years ago because of the celebrity factor, the sensational allegations and the fascination of people around the world. Parts of the trial will be broadcast live on television, adding to the scrutiny. Simpson's trial for the killing of his ex-wife and a man was televised in its entirety. But in one glaring difference, Pistorius acknowledges he killed the victim. 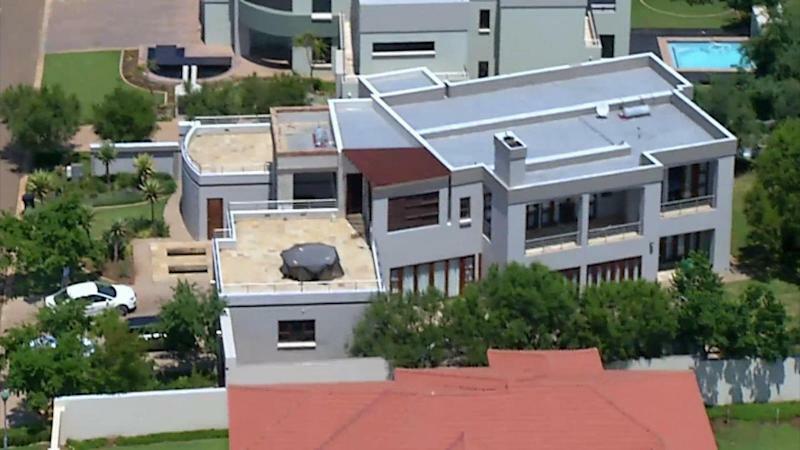 The Olympian says he thought Reeva Steenkamp was a nighttime intruder in his home in the early hours of Feb. 14 last year; the prosecution maintains he intentionally shot her several times in the bathroom after an argument. "They don't have to prove that this glove belongs to O.J. Simpson because it fits his hand," said Marius du Toit, a former prosecutor, magistrate and now criminal defense lawyer. "We know there's only one person who caused Reeva's death." Du Toit was referring to the leather glove that was found at the scene where Simpson's ex-wife and a man were killed in 1994. The glove seemed too tight when Simpson tried it on in court, prompting a defense lawyer to say: "If it doesn't fit, you must acquit." Simpson was acquitted by a jury. But prosecutors in the Pistorius case have an edge, said du Toit: "Any person that has admitted to killing another person in circumstances when your actions are unlawful will face a steep hurdle in getting off scot-free." Pistorius took such a competency test for his 9 mm pistol and passed it, according to the South African Police Service's National Firearms Center. He therefore should have known that firing through a closed door cannot be viewed in South African law as an accident, according to Andre Pretorius, president of the Professional Firearm Trainers Council, a regulatory body for South African firearms instructors. Criminal law experts believe that if the prosecution fails to prove premeditated murder, firing several shots through a closed door could bring a conviction for the lesser charge of culpable homicide, a South African equivalent of manslaughter covering unintentional deaths through negligence. Sentences in such cases range from fines to prison. They are left to courts to determine and are not set by fixed guidelines. Another key piece of evidence will be the blood spatter analysis on the inside of the toilet cubicle, according to J.C. de Klerk, a ballistics expert who used to work for the South African police. He said it could give an indication of Steenkamp's position when she was shot, including whether she was sitting on the toilet, or hiding behind the door as prosecutors likely suspect. The "back spatter and front spatter" could also indicate the sequence of shots as they hit Steenkamp and whether there were exit wounds, de Klerk said. 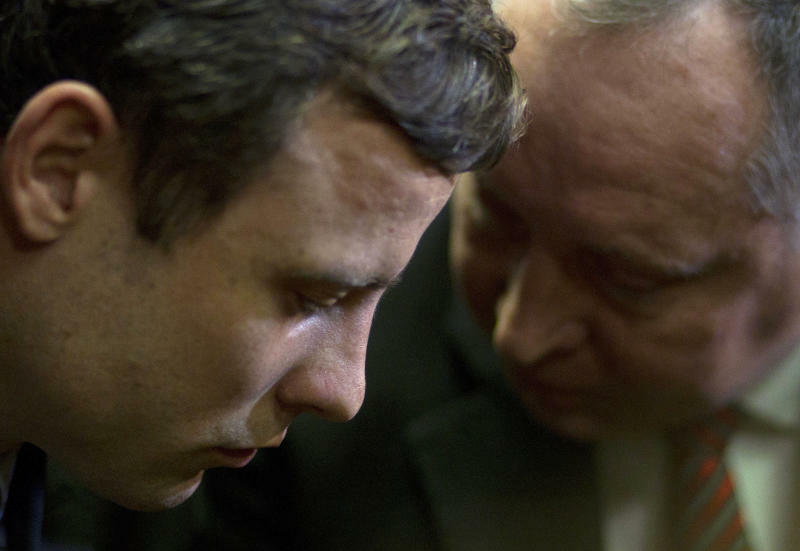 But such hard data and other factors, such as the trajectory of the bullets when they were fired, cannot support Pistorius' argument that he was responding to what he thought was an imminent threat. "It's only him," de Klerk said. "We're only going to rely on what he actually says. There's no scientific evidence that's going to prove that his life was in danger." Other key evidence could emerge from the mobile phones of Steenkamp and Pistorius that were found in his house. South African prosecutors have sought help from Apple officials to access the locked iPhone of Pistorius, who said he forgot the password. 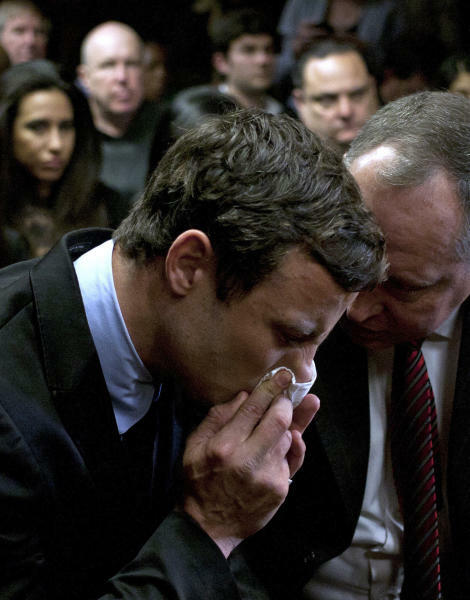 Parts of Oscar Pistorius' murder trial can be broadcast live on television by three remote-controlled cameras in court, but testimony given by Pistorius cannot be shown. Judge Dunstan Mlambo, who made the decision to allow broadcasting, said he had weighed up arguments for a fair trial from the Pistorius camp with principles of open justice and freedom of expression. Mlambo showed "an awareness of the competing considerations at play," said Justice Edwin Cameron of South Africa's Constitutional Court. He declined to comment directly on the ruling, but said he favored cameras in appellate courts. "We haven't yet done it here" at the Constitutional Court, Cameron said in an interview Friday with The Associated Press. "But my colleagues have agreed to think about it and we're in the process of exploring ways of doing it." Trial judge Thokozile Masipa, who will decide the verdict in the Pistorius case, will be assisted by two assessors. Cameron described such individuals as "often highly experienced people, often retired regional court magistrates who have dealt their whole professional lives with criminal cases, and are very astute in assessing probabilities, in judging credibility of witnesses and in applying the criminal procedure act." South Africa abolished the jury system in 1969 following arguments that whites-only juries during apartheid would be unlikely to deliver fair verdicts involving, for example, a white perpetrator and a black victim. "It was a system riddled with racism, as it was in the American south," Cameron said. Race is unlikely to be a factor in the Pistorius trial in post-apartheid South Africa, say experts, who suggest the case is likely to focus on the forensic evidence surrounding the toilet door, data from cell phones and on the character of the defendant.